The site of a Second World War tank trap formed by eleven anti tank pimples. They were situated on the north side of the aquaduct carrying the Oxford Canal over the Old Leicester Road at Rugby. 1 Single rows of pimples lining both sides of the road north of the Oxford Canal forming a tank trap. There are 11 on the west side and 9 on the east. A number of them look as if they may have been re-sited. Findspot - a Medieval pottery vessel was found east of Whitehall Road, Rugby. The site of a brickworks where bricks were made during the Imperial period. The brickworks is marked on the Ordnance Survey map of 1886. It was situated in the area of Jubilee Street, Rugby. Findspot - a fragment of a carved stone cross shaft of Early Medieval date, probably pre-Viking. It may have come from Rugby church. The fragment is now in Warwick Museum. Villa with formal terraces, pool, plantings near house, lawns, parterrebeds and other garden features. Recommended for inclusion on Local List of surviving planting and other features. World War II feature: Bofors emplacement at Rugby. The remains of a Second World War gun emplacement. All that remains is the circular concrete holdfort for a Bofors gun. It is situated in a small area of ridge and furrow between Johnson Avenue and allotments north of Bilton Road, Rugby. 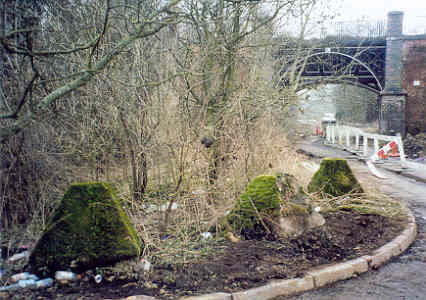 The site of a dummy factory from the Second World War constructed to protect the Armstrong Whitworth factory at Bagington by confusing enemy aircraft and prompting them to drop bombs in the wrong place. Information is from documentary evidence. Warwick defences, consisting of a Town Wall and Ditch. Documentary evidence has suggested the line for the Medieval Defences, which has been subject to excavation; in places it survives a a rock-cut ditch with eroded bedrock backfill.